SACRAMENTO, Calif. (AP) San Antonio point guard Tony Parker didn’t hesitate when he sped around Sacramento center Kosta Koufos for an easy basket in the fourth quarter. Manu Ginobili did pretty much the same thing in the third with a pair of uncontested layups. 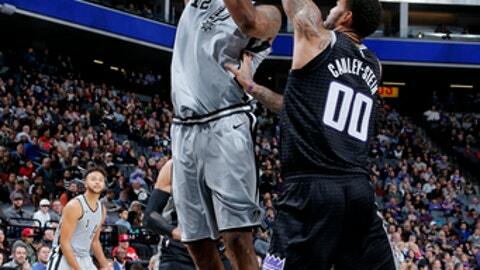 LaMarcus Aldridge had 29 points and 10 rebounds, and San Antonio bounced back from a disappointing loss to beat the slumping Kings 108-99 on Saturday night. Gasol had 14 points, 11 rebounds and a season-high 10 assists for San Antonio, which won without star forward Kawhi Leonard. It was the 10th career triple-double for the 7-footer, who was questionable with a groin injury but wound up getting extended minutes because Sacramento had two big men on the court most of the night. Three days earlier Gasol put up 20 points and 17 rebounds against Portland before sitting out against Utah on Thursday. Parker had 10 points and six assists, and Ginobili scored 15 as the Spurs extended their winning streak over the Kings to 11 games. Aldridge did most of his scoring in the first half, but San Antonio didn’t pull away until the third quarter when the five-time All-Star had eight points. Ginobili added six points in the period, including a pair of uncontested layups. Former Kings player Rudy Gay scored seven of the Spurs’ first nine points in the fourth quarter when San Antonio went up by 14. Buddy Hield had 24 points to pace Sacramento. Willie Cauley-Stein added 22 points and 11 rebounds, and Bogdan Bogdanovic scored 15 for the Kings, who were coming off back-to-back road wins over Brooklyn and Philadelphia. It was a much-needed lift for the Spurs, who had a fourth-quarter meltdown while losing to Utah 100-89 on Thursday. Aldridge spent much of the night going against Zach Randolph, his former teammate in Portland. The two big men traded buckets early before Aldridge made a short jumper to begin a 16-6 run just before halftime that put the Spurs up by 13 at the break. Sacramento scored eight straight points to open the third, but the Kings had no answer for Aldridge’s fadeaway and turnaround jumpers. Ginobili also took advantage of Sacramento’s sluggish defense when he easily drove through the lane past multiple defenders. Gay had seven points on 3-of-8 shooting with four rebounds in his first game against his former team. Gay spent the past 3 1/2 seasons in Sacramento but declined the Kings’ attempt to re-sign him in the offseason. Spurs: San Antonio made nine 3-pointers in the first half but only two after that. … Leonard was held out after playing nearly 21 minutes against Utah on Thursday, part of the team’s plan to ease him back from a quadriceps injury. Danny Green (groin tightness) also sat out. Kings: Sacramento’s usually reliable bench was outscored 43-22. … De’Aaron Fox missed his second consecutive game with a partially torn right quadriceps. He will be re-evaluated in early January. … Sacramento last beat San Antonio on Nov. 15, 2014. Spurs: Return to San Antonio to host Brooklyn on Tuesday. Kings: Travel to Los Angeles to play the Clippers on Tuesday.